Do you use Del.icio.us fully? At its most basic level Del.icio.us is a great idea. How many times have you lost your bookmarks when you moved to a new computer or your profile became corrupted or you switched browser? Del.icio.us gives us a central online repository for storing our bookmarks so that we never lose them again. It also allows us to tag our bookmarks to make finding them subsequently easier. However, Del.icio.us takes this concept a couple of steps further – in the first place, with Del.icio.us, everyone can see everyone else’s bookmarks and tags – this incredibly simple twist makes the site far more useful – it now becomes possible to see what people are bookmarking on any given topic and since you only bookmark sites which are important/useful – Del.icio.us becomes a phenomenal filter for what is good on the web. If they had stopped there, it would have been a great site! It gets even better, though! Del.icio.us has a service, rather confusingly called Inbox, which allows you to set up a search for terms of interest and it then gives you a list of all the latest bookmarks corresponding to your search term. 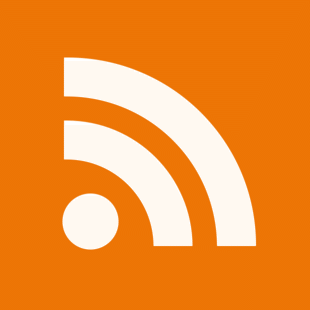 Even better than that again – you also get an rss feed for your Inbox subscriptions – so you can view these bookmarks in your rss reader – how cool is that? I know several people who use Del.icio.us and who were completely unaware of this – are there other awesome features in Del.icio.us (or other social software apps) that are not obvious? Anyone have contact details for Scott Anderson of HP? If you like to share your links with the rest of the world, you can use one of the daily del.icio.us WordPress plugins or scripts to create a daily blog entry with your most recent del.icio.us links. On second thought, you could probably use del.icio.us’ experimental “daily blog posting” feature to accomplish the same thing, if you can figure out its “add a new thingy” interface. At Freshblog I’m using / advocating the use of Del.icio.us as a substitute category manager for Blogger. To further this effort, Greg Hill has developed Freshtags, which is an interactive sidebar menu for your blog that pulls your tags from del.icio.us, allows the selection of a tag, and then provides a secondary menu list of posts that have that tag, all in your sidebar. Applied beyond the blogger / categories scenario, this would let del.icio.us users pull a list of the content in their del.icio.us account into their sidebar, and allow readers to browse that content by tag. 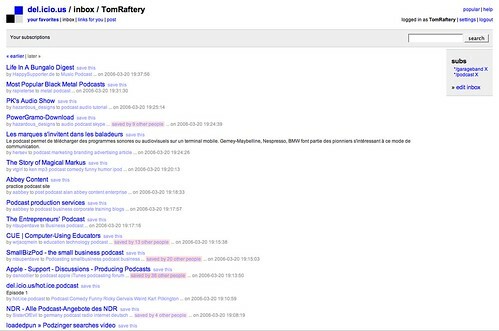 It is a great service Tom and one where alot of the magic is very subtle, things like being able to subscribe to a feed for a search on multiple tags, or media enclosures etc. I’ve been using Raw Sugar alot too lately as it has the advantage of tag clustering which sorts tags into hierarchies. To answer the original question presented by your post … No, I have not yet fully embraced the power of del.icio.us. I only use del.icio.us as an extension to the “Links” list in my blog’s sidebar, but I am aware of the full extent of del.icio.us’ offerings. The Delicious Extensions for Firefox are also very useful – when surfing the web , gives you a ‘Tag this’ button on the toolbar. I have a “Post to Del.icio.us” bookmarklet in my Firefox and I use Flock for a lot of my browsing primarily because of its tight Del.icio.us integration. I must look into the Firefox extension – thanks Paul.